LAS VEGAS, Feb. 18, 2016 – Sean Melton of Columbus, Ohio/Ohio State University, posted the top score in the all-around after the second of two preliminary sessions on the opening day of competition at the Winter Cup Challenge at Las Vegas’ Cashman Center. Competition concludes Saturday at 10 p.m. ET with the finals, which will be webcast live at WinterCup.com/live. Melton posted scores of 14.400, floor, 14.700, pommel horse, 15.400, still rings, 15.050, vault, 15.050, parallel bars, 13.150, horizontal bar, giving him an 87.750 in the all-around. Yul Moldauer of Norman, Okla./University of Oklahoma, was second with an 87.350. Three-time U.S. champion Sam Mikulak of Newport Coast, Calif./Team Hilton (U.S. Olympic Training Center), who made his return to competition after suffering an Achilles injury that kept him out of the 2015 World Championships, rounded out the top three with an 87.100 total. In the first session, Kanji Oyama of Huntington Beach, Calif./University of Oklahoma posted scores of 14.450, floor, 14.050, pommel horse, 14.800, still rings, 14.450, vault, 14.300, parallel bars, and 13.100, horizontal bar, for an 85.150 total in the all-around. Grant Breckenridge of Libertyville, Ill./Stanford University, 84.700, and Levi Anderson of Spring, Texas/University of Oklahoma, 82.950, rounded out the top three. 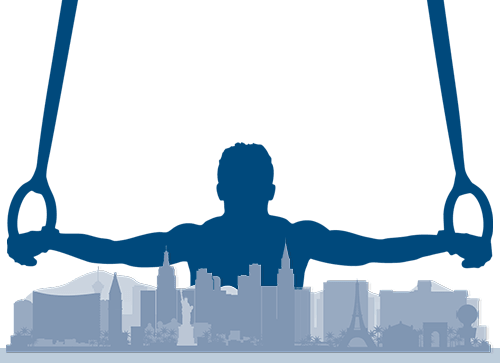 Performances at the 2016 Winter Cup Challenge will help determine the 15 men who will comprise the U.S. Men’s Senior National Team through the 2016 P&G Gymnastics Championships in Hartford, Conn. June 3-5. The six members of the 2015 World Championships squad, plus the alternate, retain their spots on the national team. The remaining eight spots will be determined based on the following criteria: the top three ranked all-around athletes who are not already on the senior national team; two based on the National Team Points System; two athletes selected by the Men’s Program Committee; and one selected by the national team coordinator. The top 42 gymnasts, according to the Men’s Program Committee’s points ranking system, will advance to the final competition, along with the top three gymnasts on each apparatus. The all-around and individual event champions will be determined via a combined two-day score. For information on the points ranking system used for advancement to the final round, as well as the one for determining the national team. Several ticket options are available: both Winter Cup preliminary sessions, $25; Winger Cup finals, $25; and all-event pass, which includes both the Winter Cup and BlackJack Men’s Championship, $50 for adults and $40 for children/students. Athletes participating in the BlackJack Championships may purchase tickets for the Winter Cup finals for $15, with a $25 ticket for coaches. wintercup.com is a USA Gymnastics production. To learn more about USA Gymnastics, visit usagym.org.